What seemed like an emergency when I wasyounger seems less urgent today. Living a long time gives the golden gift of experience which provides answers to how to solve problems, but more importantly, perspective. What seemed life or death at twenty, or even fifty, at this stage of approaching 70, now seems just another blip in the landscape of life. Oh no, I used to think, my boss is mad at me. I might get fired and that would be the end of everything! But now I see how I never would have explored better options if I had not left that job, which I did on my own and never did get fired. Oh no, I used to think at fifty, my life is almost over and it is all downhill from here! Now, I see many things improve with time . Later life is a different stage with new requirements like change in diet or fewer jumping jacks and more long walks, but life can be better as we grow older. Of course I am lucky and found art, and an art form which I can use even with failing abilities. Painting, especially watercolor, is non toxic, easy to set up, light weight, inexpensive, and demanding only of my focus and determination. The rewards are great. A sense of seeing the world differently after each session. Although it is work, it is mostly non stressful work and I believe lowers my blood pressure. Escaping into the right brain world of art is a wonderful break from elder life's stresses such as getting used to bodily changes and loosing loved ones. After using that escape one comes back in stronger condition to face the latest challenge. The sense of time is elastic. What seems like an eternity to a four year old(one year) can seem to flash by to an eighty year old. Scientists have studied this and have a few ideas of why this is. Too Old to be President? "I will not make age an issue of this campaign. I am not going to exploit, for political purposes, my opponent's youth and inexperience," Ronald Reagan quipped when asked if, at 73, he is too old to be President. Trump is seventy and Hillary no spring chicken. Obama still looks youthful leaving office if a couple of decades older looking than when he started. Are there real concerns with someone being president at a later age? Or taking up any profession for that matter? Age brings wisdom if we learn from our mistakes and are self-reflective. Wisdom does seem more important than physical fitness, and we all know that some 20 year olds are in terrible shape, while some 90 year olds run marathons. But it is pretty hard to fake wisdom at a young age. Experience takes time. To take up art later in life requires very little physical strength. Even failing eyesight can be a plus, and hearing is not too important. Does experience and wisdom help us learn painting or other art forms? Usually wise people don’t give up when the going gets tough at first. They can see ahead and know trial and error will lead to success. But more than that, the wisdom of having experienced many things in life can lead to meaningful appreciation of subject matter, and the depiction of the natural world. Many older people care less about public opinion and therefore avoid the ego driven side of art. They realize the process is the reward, and the product a nice side benefit. 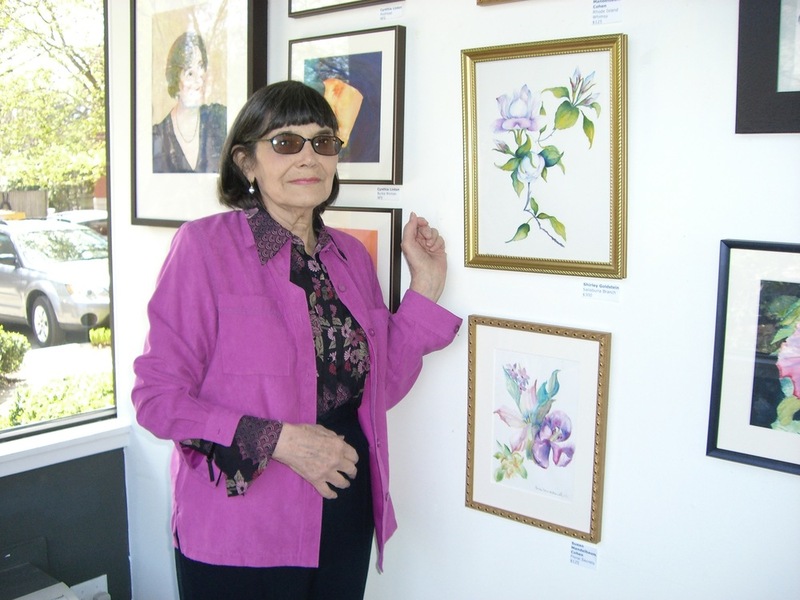 Finally, older people are looking for ways to extend their mental abilities, and art does that. It prevents dementia and keeps those neurons activated. And it’s not so bad to have something to show for time spent, to build self-esteem. While it may be too late to run for President, you can still become an artist no matter how old you are. Every week I hear new stories from these long-lived folks, art being a conduitto so many other aspects of a personal history. While some don't remember me from week to week, once we get started the paint and paper form their own relationship with the artists. Everyone is living fully in the moment, but also pleasant memories are uncovered and shared. Everyone has an artist buried within and to bring that to life intensifies and illuminates experiences – present and past. Artist eyes on the world create awareness of the moment, and show how to live fully in each one. There are lots of arts and crafts, keep busy-kind of art offerings for seniors, but many are capable of much more. They can have a deeply satisfying, true experience of being an artist by learning to draw exquisitely, understand colors, and gaining the techniques of a medium. This gives them a new language to express their inner lives, as well as understanding of the natural world. A new study from the Mayo Clinic shows that when people engage in art making later in life, they have less than half the amount of cognitive impairment compared with others. Wendy Soneson can open this world for you or someone you love: fully engaged in learning and conversation about art. By hearing stories, and providing guidence in the tools needed to help express them, this is a joyful spot in the week to look forward to. Wendy has been bringing this experience to students for 40 years and now specializes in working with retired individuals, with attention to personal needs. Her testimonials will tell the story of her impact on the lives she touches. We are looking at close to a quarter of the US population being over sixty in the next few years, with many elders in various states of retirement and declining health. The business community is quick to jump ahead and find ways to capitalize on their needs, to siphon off whatever seniors have left of their savings and social security. A growing field is the industry of addressing fading mental capacities with programs, classes, books and apps to help keep people sharp. It is interesting that a study from the Mayo Clinic shows that those who engage in art making are half as likely to loose mental capacities. Why is this? History has shown that artists usually do not retire and do much of their best work later in life. Is it the activity of art making that keeps them going or the love of the work itself that incites them to keep active enough to do it? It does not seem to matter if one takes up art late in life: the positive effects are still in place. Certainly stimulation of the brain is part of it. Even though a painter might sit in a chair and move very little, the effort of determining shapes and colors and values, then translating them into visible forms can burn up calories, and if the brain happened to be hooked up to electronic measuring equipment, it would be burning up the screen with activity. Unfortunately many people do not take up art simply because of the false belief that certain people are born with talent, and they are not one of them. Another fear is that they will have to start at the beginning. The older you are, the more you think you should already know things. The final barrier is the lack of challenging art classes for the elderly. Most senior centers support only arts and crafts activities and don’t expect the students to learn the basics of color theory, observational drawing or correct use of materials. The idea is to keep them busy playing with paint, like a preschool class. YouTube is doing a good job of recording seniors doing advanced artistic activities, such as dancing the tango in an exhibition, or singing in a TV show competition. But Grandma Moses is just a joke in our society, not a real role model. Based on the new studies about art extending the quality of life, venture capitalists would do well to fund entrepreneurs with apps, classes, programs or books that bring this idea to the public. Or, seniors can just enroll in the local fine arts school. Some even offer discounts to the elderly.